Spacious interior, cooks fast and effectively, easy to clean too! No real complaints - it's a solid mid sized solo microwave. Looking to buy a mid sized solo microwave that's simple to operate? The 25 litre Sharp R372SLM will be ideally suited, with a generous 900w power output and intuitive control system. Finished the the typical Sharp silver and black colour scheme, the R372SLM is smart in appearance, as well as functional and practical, with it's clearly labelled touch control system providing an easy method of programming each cooking cycle. The LED display located in the top right is bright and crisp, and can be read in a variety of lighting conditions - no complaints here. The digital timer can be set to the nearest 10 seconds, which should provide enough accuracy for the majority of users. Simply press the 10 minutes, 1 minute and 10 seconds buttons to program in the desired time period and you're good to go. These can be easily controlled even with greasy fingers, and the exterior wipes clean without much effort. In terms of size, the Sharp R372SLM features a 25 litre capacity, and measures 51.3cm by 30.6cm by 42.9cm externally. The interior cavity is nicely finished in a wipe clean surface, and measures 33.0cm by 20.8cm by 36.9cm, and so should accommodate most large dishes. In terms of performance, our testers were impressed with the R372SLM - it cooks quickly and effectively, thanks to the 900w of power that it's packing. 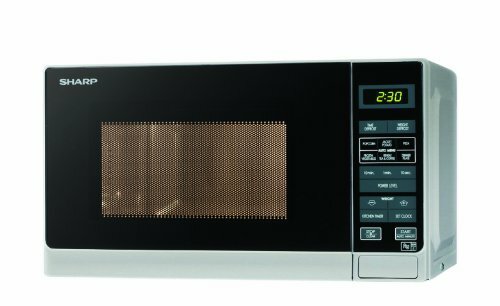 The majority of microwaves only feature 800w of power, so the Sharp R372SLM has the capability to heat up faster when using the highest of the eleven power settings. In addition the eight autocook features should save you time from guessing how long to cook common food types - we found it to be fairly accurate, and our jacket potatoes turned out nicely. For the money our test team were impressed with the Sharp R372SLM, finding it simple to operate, easy to clean and thought that it offered excellent value. There aren't too many mid sized solo microwaves on the market compared to the abundance of 20 litre smaller models, and the Sharp R372SLM is certainly one that we'd recommend. The Sharp R372SLM is well worth considering if you have a mid sized household - it's large enough to take the majority of plates, but doesn't take up too much precious kitchen space. It cooks fast, thanks to the 900w of power, and is very simple to use.